The last time you played in a sandbox I’m guessing the most you emerged with was a few sandcastles and sand-filled shoes that your mom yelled at you to remove before returning to the house. Richard Hall, vice president of Commercial Platforms and Mark Schauer, director of R&D Studio at 84.51° had a much different outcome. So, what’s a digital sandbox? It’s basically where data scientists, analysts and tech-gurus devote themselves to a project and play around with different platforms and ideas until they emerge, ~10 weeks later, with something brilliant – like OptUP! A digital sandbox is a place that moves fast and finds the right balance between a product that’s perfect and one that’s good enough to share with real people to sense-check the product without wasting valuable time. Kroger Dietitians were utilized to help with scoring of the product and together the team developed a solution that makes sense – and makes choosing healthier options easy. 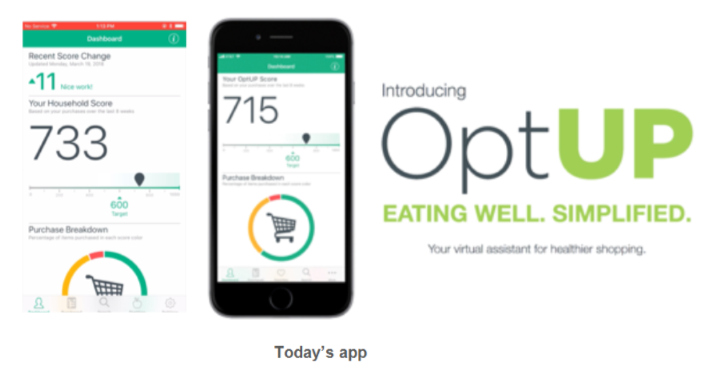 Originally named “Healthy Shopper,” OptUP moved from idea to basic proof-of-concept to an associate pilot. This provided the opportunity to get direct feedback from real users through behavioral data and focus groups – that influence shaped the app you see today. Of course, all of this sounds easy-peasy, but we all know it wasn’t. It took relentless selling from Richard, Mark and their teams to prove that the app was valuable to our customers and to the company in the form of healthier and happier shoppers. Checkout this quick video to learn more about what OptUP can do for you! What you see from OptUP today is just the beginning. The team is continuing to brainstorm additional ways to show you how to live your best, healthiest life, with small but impactful changes that Redefine the Grocery Customer Experience. Keep your app updated – you’re going to want to see all the things OptUP can do for you!